traderjj has no other items for sale. 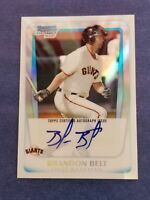 MONTE HARRISON 2014 BOWMAN CHROME REFRACTOR AUTOGRAPH ROOKIE AUTO PROSPECT RC !! 2017 Bowman Chrome Draft Gleyber Torres GOLD REFRACTOR /50 BGS 9! 0.5 from 9.5!